SHORT for persons under 5'8"
Our newest strap was designed with the DOT/Road Ranger applications in mind. 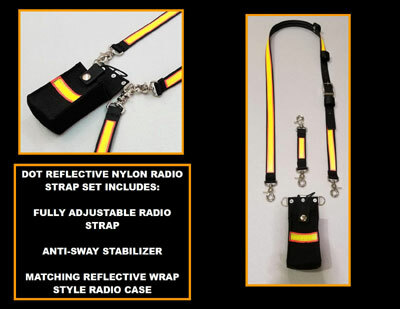 The strap is made with a durable, heavy duty 1 inch wide ballistic nylon webbing, and 3M Fire Resistant double reflective trim sewn along the entire length of the strap. The radio strap is a two piece strap, designed just like our leather radio straps. TWO mic loops are included on the strap. Trigger snaps on each end for attachment to the radio holder. Ultra durable bartacking keeps the trigger snaps secure. Includes matching anti sway strap. Also fits the Kenwood 272G, TK-3160, and TK-2170. The full pocket style is made with ballistic nylon webbing and has a strap that secures the radio from the top to keep it from shifting upward during vigorous motion. Metal rings are secured to the holder for attachment to any radio strap and is a lightweight, streamlined design. The hardware on this radio holder is the same hardware you will find on our leather radio holder. Very lightweight yet exceptionally durable!